Tribe Stamped Phrase Bangle Bracelets Only $24.95! You are here: Home / Great Deals / Tribe Stamped Phrase Bangle Bracelets Only $24.95! These bracelets are beautifully simple in both design and sentiment. 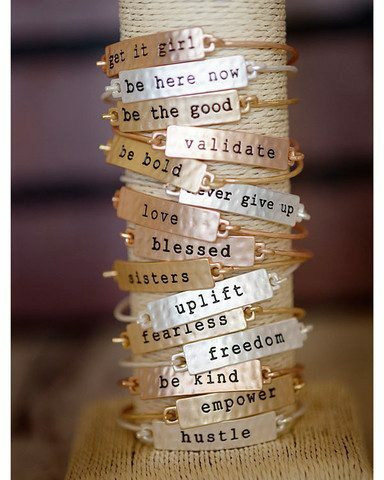 The uplifting messages of these Phrase Bangle Bracelets are very empowering! Get the Tribe Stamped Phrase Bangle Bracelets for Only $24.95! The messages and finishes vary, and the design is slim enough to wear more than one. A great birthday/graduation/bridal party gift!